My Favourite Picks from Eddie Bauer Holiday 2013 Collection! Last December I wrote about my 20-year affair with Eddie Bauer, modelled their Travex line in February, showed pieces from the Eddie Bauer summer line in June, held an Eddie Bauer back-to-school contest in August, and my brother Adam Ess wrote about his new Eddie Bauer Journeyman Leather Bomber Jacket in October! Now it's November, and it's only fitting that I rave about the Eddie Bauer Holiday 2013 collection! WOOT! If you've followed my personal health and fitness journey, you'll know that I've lost 70 lbs since January 2013. Through healthy eating habits, and daily exercise, I've gone from a size 14 (XL) to a size 8 (medium). Although this development has been great for my health, it's been horrid for my wardrobe: nothing fits me anymore! But my good friends Eddie Bauer.com came through for me for the Holidays, and now I have beautiful late fall and winter pieces! Not only are the pieces from the Eddie Bauer 2013 collection beautiful, but they also fit well and are quite cozy to wear! Some of the Eddie Bauer pieces can even be purchased from a size XS to a XXXL, and have both petite and tall sizes! Follow below to see my Eddie Bauer pics for the season! 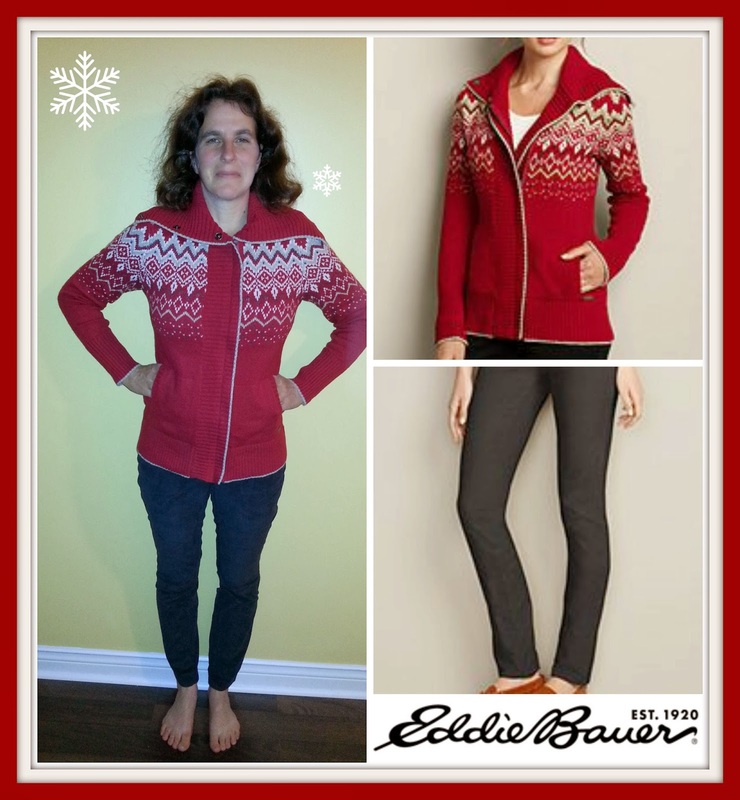 I really fell in love with the Eddie Bauer Oslo Cardigan Sweater, $89.95, seen above in scarlet colour. It's a blend of 40% cotton/30% wool/30% nylon, with pockets on either side. What I particularly love about this sweater, is that it zips/unzips from top to bottom, so you can regulate your body heat in the winter. It also has a high collar that lies flat or can act as a face-concealer in very cold weather. It fits true to size, and I'm wearing a size medium above. It also comes in bone and wineberry colours. Underneath the Oslo Cardigan Sweater, I'm wearing a tank top layer (also in size medium), which I will describe later in this blog post. Shown above, I'm wearing the wonderful-fitting Eddie Bauer Slightly Curvy Skinny Cords, $59.95, in carbon colour. The cords fit like a glove, and there is a bit of stretch to the material. I love that the cords can be dressed up or down, and that the cording is very slim (18-wale cotton corduroy) and soft. I'm 5'8", 145 lbs and the size 6 pants are the right length and fit me well. Also available in lavender mist and pumice colours. If you're used to extreme winter temperatures, then you'll appreciate the Eddie Bauer Stine's Favourite Flannel Shirt, $49.95, basil colour. It's cozy, fits true-to-size, and toasty warm! I'm wearing a size medium. This fantastic shirt comes in six other colours: brook, dark sable, mushroom, red, scarlet and vintage grey. 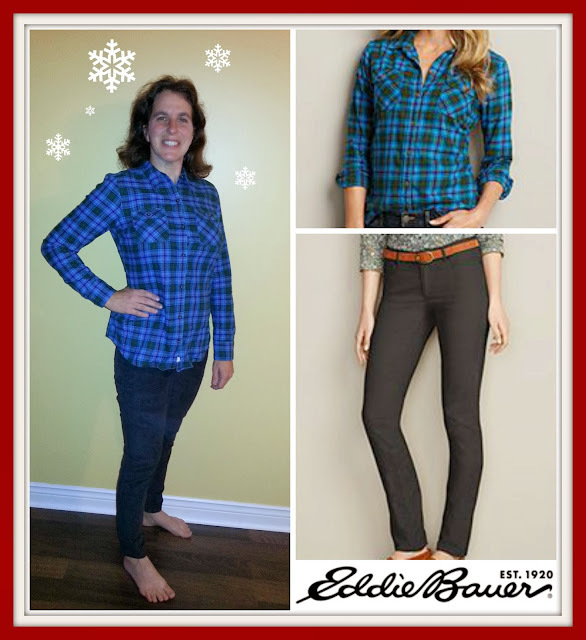 I've paired the Stine's Favourite Flannel Shirt with the very versatile Eddie Bauer Slightly Curvy Skinny Cords in carbon colour, discussed above. Above are more versatile pieces from the Eddie Bauer Holiday 2013 collection! I'm wearing the Eddie Bauer Christine Cardigan, $49.95, in brick. It buttons up the front and is a 55% cotton/45% nylon blend. I'm wearing size medium. It also comes in 7 other colours: black, boysenberry, charcoal heather, dark green, heather oatmeal, heather teak, and purple heather. Beneath the cardigan layer, I'm wearing the Eddie Bauer Layering Tank Top, $19.95, in ivory. This is an essential piece to any wardrobe, and it is also available in black, dark berry, deep teal, and white. In black, I've coordinated the Christine Cardigan with the Eddie Bauer Ponte Skirt, $59.95. It's a beautifully fitting piece with a fair amount of stretch, a side slit up the side, and a wide/flat waistband for a flattering fit at the midsection. I'm wearing a size small, as I find that the Ponte Skirt has a generous fit. It's a great piece to have for Holiday special occasions! You may find this surprising to hear, but as an adult I've never owned a raincoat or waterproof layer. Strange but true! That's why I was thrilled for the Eddie Bauer Snowline Shell, $169.00, shown above in wave colour. It fits great and is waterproof, breathable and windproof. I'm wearing the medium, above, which leaves room for a t-shirt and sweatshirt layer. Also available in black, night (dark purple) and snow. Beneath the Snowline shell, I'm wearing the Eddie Bauer Quest Fleece Jacket, $79.95, also in wave colour, also in size medium. This is a toasty warm, supersoft fleece that fits well and can attach to the Snowline Shell layer, rendering it a 3-in-1 jacket. The points to attach the two layers together are at the back of the neck, and at the two cuffs. If you're from a cold climate, this second layer will keep you warm in fall. Also available in black, steel and vibrant purple. Wear the Snowline Shell Jacket separately as a waterproof layer in non-winter months, attach it to the Quest 200 Jacket for added warmth in late fall, or wear the Quest 200 Jacket separately in early fall or spring. Also in the photo, I'm wearing the Eddie Bauer Snowline Insulated Pants, $129, black colour, size small. These are a women's snowpants, WOO-HOO! Just as I have never owned a raincoat in adulthood, neither have I owned snow pants. I'm delighted to go tobogganing with the kids this season--and not have freezing cold, dripping wet pants! The pants are a good length for my 5'8" frame and a comfortable fit. A note about the sizing on the Snowline Insulated Pants: they are sized big to fit long underwear AND a pant layer beneath. Therefore, the size small would fit a women wearing a pant size 6 or 8 with one or more layers beneath. Last but not least, I've completed my outfit with the Eddie Bauer Snowline Mittens, $44.95, black colour, size medium. The mitts are waterproof and contain a top zipper in which to place a heat pack, which Eddie Bauer kindly includes with the purchase! If you also like snow play or snow sports, waterproof is the only way to go! You may also find it surprising that as an adult, I have never owned a proper fall jacket! Where I live in Canada, we often go from warm weather to very cold, so in the past I've always suffered through those in-between patches of fall weather that usually only number a few weeks. So I was delighted to own the Eddie Bauer Snowline Insulated Jacket, $199.00, in night colour (dark purple), size medium! It's very similar to its sister the Snowline Shell in size and fit, and leaves room for a t-shirt and sweatshirt layer underneath. The Snowline Insulated Jacket is the perfect late fall jacket for Canada and it handles all our in-between weather. For example, the other day I was hit by wind, rain AND snow all at the same time. The jacket is a duck material and the rain and melted snow just beads up and rolls off. I salute Eddie Bauer for adding the fleece-lined hand pockets, so soft and cozy when you're not wearing gloves! There is a similar layer at the neckline/face, and I love that the collar zips high to protect against the elements. Also available in black, snow and wave. I've paired the Snowline Insulated Jacket with the Snowline Insulated Pants and Snowline Mittens, all discussed above. You Can WIN This In the SnyMed.com Contest, Below! 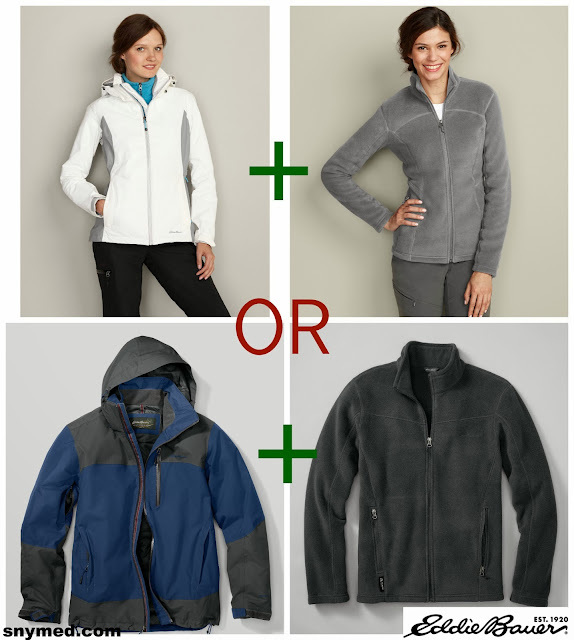 WIN an Eddie Bauer Snowline Shell Jacket AND an Eddie Bauer Fleece Jacket (for women or men), from SnyMed.com! (Women: Sizes XS-XXL. Also petite or tall available. Men: Sizes S-XXL. Also tall available. Size and colour are subject to availability.) Contest open to Canada and the USA, and ends December 11th, 2013. Please note that Christmas delivery is not guaranteed for the winner. Thank you for your understanding. Leave a COMMENT below stating your favourite item in the Eddie Bauer Holiday 2013 collection, as shown in my blog post, above. OR tell me what your favourite thing is about Christmas, the Holiday season, or the months of November and December! Then, use the entry form below to enter. GOOD LUCK! I love the Eddie Bauer Snowline Insulated Jacket. ooh...I really like the Eddie Bauer Snowline Shell! I like the Slightly Curvy Skinny Cords - very versatile. I like the Eddie Bauer Snowline Shell the most. I love the white and grey Snowline Insulated Jacket. All things Eddie Bauer. I love the snowline shell. All things Eddie Bauer. Love the snowline shell. I too have never had a proper fall jacket, I just wear a warm sweater for a few weeks. I love the eddie bauer snowline insulated jacket!!! i like the snowline winter coat !!!! My favourite thing about the holiday season is to go skating with my friends and family and then having some hot chocolate afterwards! Definitely would need a warm jacket for that. I like the Slightly Curvy Skinny Cords. My fav thing about Nov & Dec is the snow! I love the Snowline Insulated Pants. I could really use them when we go sledding with the kids this winter. I like the Eddie Bauer Snowline Insulated Jacket. I love to walk in the winter and that would keep me very warm. My favourite is the Eddie Bauer Snowline Insulated Jacket, living in Alberta it's a necessity to have something like this! ... I love the - Eddie Bauer Snowline Shell !!! ... I love the -- Eddie Bauer Snow Line Shell !!! I like the Snowline Insulated Jacket. My favorite thing about the holidays is all the parties with great friends and family. their outer wear are my fav. my thing about Christmas is hubby gets extra holidays which means more time to spend with each other and my grand children. Eddie Bauer Snowline Insulated Jacket looks awesome. Love the Quest 2000 JAcket! I like the Ponte Skirt! I love the snowline shell jacket! LOVE IT! If I won, I would choose the men's. My 19 year old son needs a new jacket! Thanks for the chance. I love the skinny cords! I like the skinny cords. I really love the Eddie Bauer Stine's Favourite Flannel Shirt. I am a big fan of flannel in the colder weather and I love the colors they come in as well. My fave is the Eddie Bauer Snowline Insulated Jacket. Looks amazing. Best thing about Christmas season is playing outdoor pond hockey with friends and family. Could really use an Eddie Bauer jacket to keep me warm this year. I love the holidays because it's one of the only times each year that the entire family gets together! I love warm, cozy sweaters, so am drawn to the Eddie Bauer Oslo Cardigan Sweater. I love the Snowline jackets. That Christine Cardigan is my fave - love the colour too! My favourite is the Eddie Bauer Snowline Insulated Jacket. Perfect for hiking the wetlands in winter! I like the Eddie Bauer Snowline Shell. I like the Christine cardigan! The Oslo Cardigan Sweater is my fave. I like the Quest 200 Fleece Jacket. i love the Snowline Insulated Jacket. I Love everything about Eddie Bauer and the Holiday season, almost my entire wardrobe is from there and it lasts forever! I really like the snowline insulated jacket and mittens. I love those mittens!!! I like both the Eddie Bauer Snowline Shell Jacket AND the Eddie Bauer Fleece Jacket that you have for us in the giveaway! 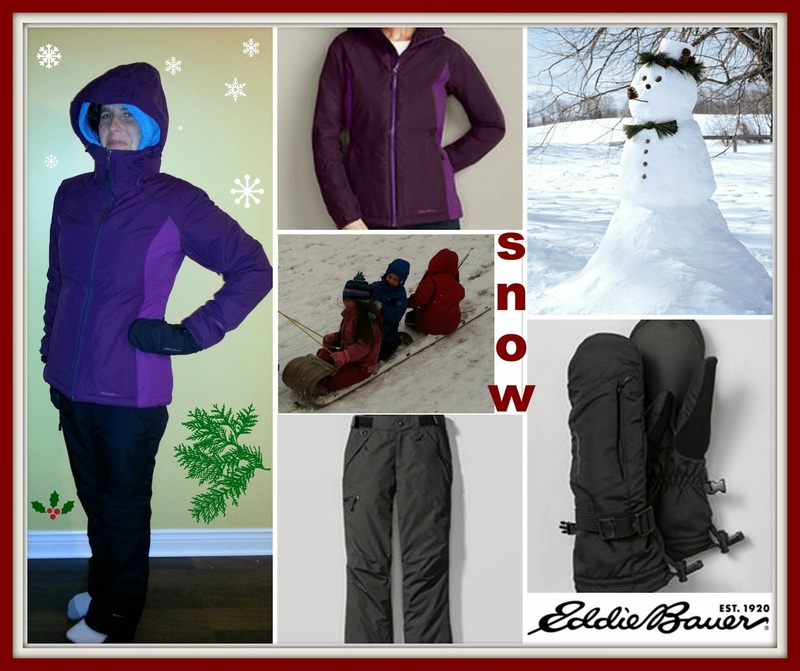 I love the Eddie Bauer Snowline Insulated Jacket, $199.00, in night colour (dark purple). This would help me through the cold Canadian winters. On the Holidays I`m looking forward to spend quality time with my family. I enjoy the Advent season leading upto Christmas. I like the Bauer 200 Quest fleece jacket...warm & toasty! My favorite is the Snowline Insulated Jacket! Fav thing about Christmas is time with family snowmobiling! The Christine cardigan is my favourite--in brick! I really like the cardigan! EB has the best jackets! These two are great looking. I really like the Oslo cardigan as well. Very pretty and seasonal without being too Christmassy - so you can wear it all winter. I can't find you on Vine! Graham, it's "SnyMed". Try that & let me know if it works for you. Thank you! I like the flannel shirt. My favorite thing about christmas is all the get-togethers with family and friends! My fave thing about this time of year is the Christmas music. Love love LOVE the Eddie Bauer Snowline Insulated Jacket! I really like the Snowline Shell in wave! I love, love the Oslo Cardigan! I want one! I love the fall leaves. The visible change in season plus the cool air gets me ready for the holidays. I love the Snowlinw Mitts!! I like the Snowline Shell. I am not fond of cold weather so any jacket that is warm makes me very happy. 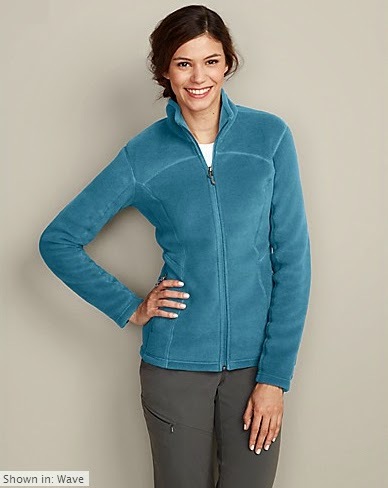 Eddie Bauer Fleece Jacket - Love it! I like the snowline shell in wave colour. I like the Quest 200 Jacket! I enjoy the changing seasons. I just wish spring would come a little earlier. My favorite thing about these 2 months is the family and friend get togethers, it is the best time of the year, by far! I like the Eddie Bauer Quest 200 Fleece Jacket. It looks warm and I like it's slim fit. My favorite is the Eddie Bauer Oslo Cardigan Sweater. The thing I love about Christmas is being together with all family members and sharing gifts, stories and singing Christmas carols. The thing I like about Christmas is being with all family members while sharing gifts, stories and singing Christmas carols. The Eddie Bauer Snowline Insulated Jacket would fill the bill for me. My favorite thing about the holiday season is the joy that is all around!! My favorite thing about the holidays is the joy that is all around!! I really like the Snowline Shell in the Wave color. I love November. You still get some nice mild days and the snow hasn't started to blow yet. I love November. You can still get some nice mild days and the snow hasn't started to blow yet. The Snowline jackets are very nice! I love that purple jacket. Purple is my favorite color! I like the Eddie Bauer Snowline Shell!!!!! I love the Snowline Insulated Jacket! The snow is what I love most about the Nov/Dec months. It's not as bitter as JAnuary and we can enjoy the outdoors for abit. I like the Skinny Cords, they look comfy. I have loved eddie bauer collection forever! my brother always bought EB and i always stole his t shirts and sweaters :) im excited for christmas to watch my lil ones open their gifts and even more excited about the cold....sweaters, boots and scarves!!! My favorite is the Eddie Bauer Snowline Insulated Jacket. It looks warm, comfortable, and snazzy. Ooooh, I used snazzy in a sentence. i really like the oslo cardigan, too! My favourite item shown is the Snowline Shell jacket. I love the Eddie Bauer Snowline Insulated Jacket - I'm feeling the cold today. I like the snowline winter coat. I absolutely love the Woman's Eddie Bauer Snowline Shell Jacket! So pretty! 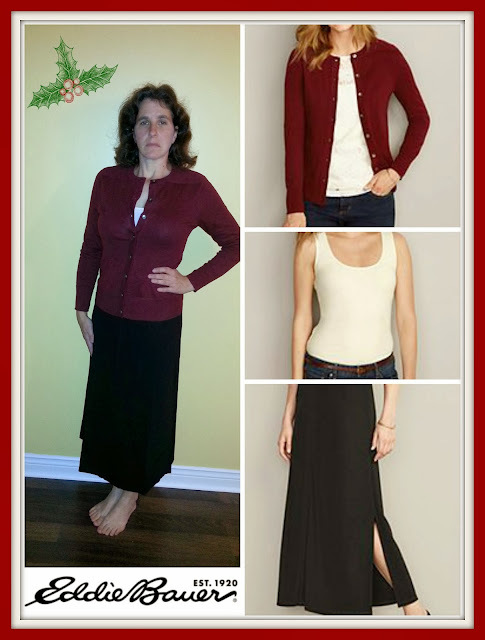 I love the slightly curvy skinny cords thanks for the contest great blog! Eddie Bauer is the bomb diggity! My favourite thing about November is my birthday! My favourite item in the Eddie Bauer Holiday 2013 collection is the Eddie Bauer Ponte Skirt. Nov & Dec are great because there is no yardwork and sweatiness. It's time to kick back and play. I LOVE the Oslo sweater! It looks so comfy and warm for the cold Canadian winters! This is such a classic item that women of all ages would wear! Not to mention, red and white - so Canadian, eh? 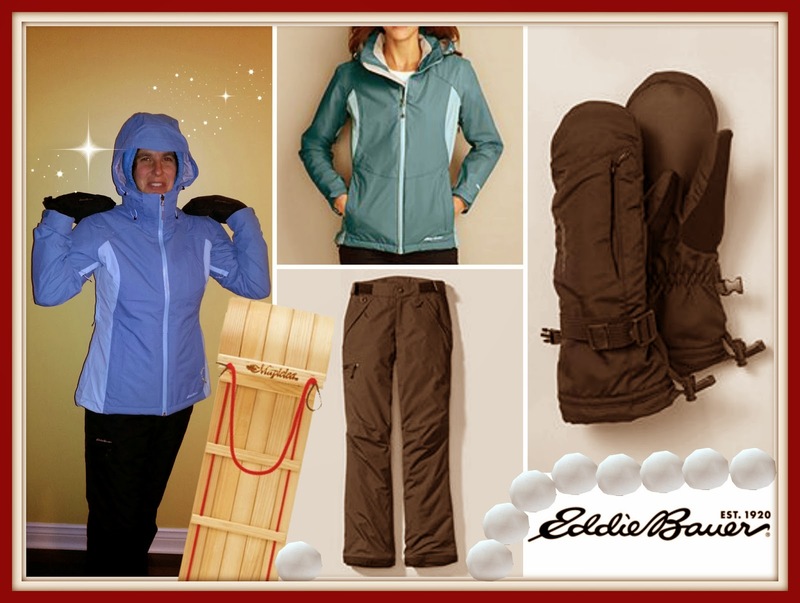 I like the Eddie Bauer Insulated Jacket, as well as the layering tank top! I love the red Oslo cardigan. I have an Eddie Bauer jacket for many years now, and I love it. But more importantly - 70lbs! 70 lbs! Wow, that must feel so amazing! You look great and it's awesome that you have done that for yourself. I am trying too - 20 lbs so far and it has made a huge difference. I don't think I am being as diligent as you, but still! Congrats! Dani, congratulations on having lost 20 lbs! That excellent and you're right that it makes a huge difference! Imagine if you had to carry around a bag that weighed 20 lbs--and you had to carry it everywhere you go. That is one 20 lb bag you'll no longer need to carry. I love the red sweater...so cozy and warm! I like the Eddie Bauer Snowline Shell! My favourite thing about the winter months is going skating, so I'm hoping to stay warm this year in the Snowline Shell Jacket and Fleece Jacket! my favourite thing about winter is NHL, and my favourite thing about christmas is watching the excitement on the kids faces christmas morning. I love all the pieces and envy you greatly. My actual favorite is the Eddie Bauer Ponte Skirt but that is going on my wish list and instead am going with my much needed and 2nd favorite, the Eddie Bauer Snowline Shell Jacket. Really like the Snowline Jacket, would be great for skiing! I love the Snowline Collection, especially the Snowline Insulated Jacket. Thanks for the awesome giveaway! I love the Snowline Collection, especially the Snowline Insulated Jacket. My favorite item in the Eddie Bauer Holiday 2013 collection is the Snowline Insulated Pants. I have never owned snow pants either but these look both functional and chic. I love the Snowline insulated jacket...and playing in snow! My favorite item in the Eddie Bauer Holiday 2013 collection is the Oslo Cardigan Sweater. I love the cords. You look fantastic! 70 pounds is huge! Thanks so much, Paula! I feel a lot better now. Let it snow ... need an insulated jacket ! !